Start as You Mean to Go On as a Parent. Do not start habits you will later want to break or allow habits you will later want to break. Just like every story has a beginning, so does every life. And just like the beginning of a story impacts what is to follow, so does the beginning of life impact what is to follow. 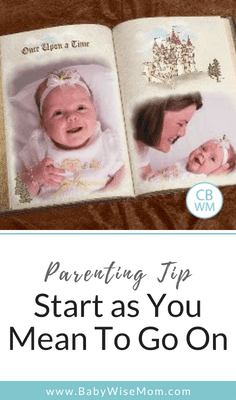 In Secrets of the Baby Whisperer (affiliate link), Tracy Hogg suggests to readers that they start as they mean to go on. This idea is found on page 48. What this means is that when you bring your baby home from the hospital, you start life with your baby as you want it to be in the future. If you want your baby to self-soothe, you start now. If you want your baby to sleep in the crib, you start now. If you want baby to be on a schedule, you start now. Hogg mentions that many people think they will do these things around three months of age, and she states that three months is not some magical age. She also states that by then, your baby will likely have learned a lot of bad habits. You will encounter difficulties you couldn’t have avoided or at least minimized had you started as you meant to go on from the beginning. Let me illustrate that with my own experience. I brought Brayden home from the hospital unsure of what I wanted to do with him, but pretty sure I would be able to basically wing it. I consider myself an intelligent person. I know I am a good problem solver. We spent nearly the first two weeks with my parents because we were moving. In that time period, Brayden was held almost around the clock. He then was not good at sleeping while in bed alone and also in no way capable of soothing himself. I started On Becoming Babywise (affiliate link) with him at 9 weeks old. It took until four months for things to be pretty good (he didn’t cry for naps anymore). Then it took until 6 months for him to STTN and for naps to extend past 45 minutes in length consistently. I knew I had caused or allowed to be caused a lot of his sleep difficulties. When I was pregnant with Kaitlyn, I had decided I would start cry it out sleep training with her at 3 weeks old. We got home from the hospital and at first she was really sleepy. At 5 days old, she stayed awake finally for a real waketime. I went to rock her to sleep, then thought, “She already sleeps so well on her own, why do I want to teach her to fall asleep differently?” I also thought it wouldn’t be fair to teach her to rely on rocking only to take that away two weeks later. I decided she was ready and started cry it out (CIO) right then. I put her in bed, ready for some crying. She went to sleep without crying! Now, not every going to sleep session was like that, but she was overall much easier than Brayden was when it came to learning how to sleep independently. By 8 weeks, she was done crying all together for naps. It took her the same amount of time as Brayden, but she improved more quickly, and she was done crying before Brayden even started. I have used that same philosophy with her for her whole life, and things have just been so much easier. This is akin to the idea of parenting outside the funnel (see How to Know What Freedoms to Give Baby). If you teach your child to rely on something or allow something your child isn’t ready for, it will only cause more work for you in the future, as well as more frustration for your child. Start as you mean to go on. Most “problems” you are having with your children are really your fault. They are happening because of something you are or are not doing. Hogg points out that parents need to take the lead and that you are smarter than your child. Children are dependent on parents for more than physically taking care of themselves; they need to learn morals and values from parents. They need to learn how to behave and how not to behave. This idea of start as you mean to go on is also a Babywise principle (see “Mom, not baby, decides…”). Try to be mindful of what you are doing and how that will affect the future. This is harder to do with your first child than the others because you have never been there before. Think it through and your life should be much easier, and so will the life of your child. Great post! I’ll just add a couple things that new parents should consider before they even start. The “start as you mean to go on” implies that the parents know how they mean to go on. It takes some forethought to determine exactly what you want from your kids and how you want them to behave. Some people are perfectly happy nursing their kids to sleep until they’re 2.5 years old. But others of us want our babies to be sleep trained much earlier. So instead of winging it like you said (which we also did with my colicky first born), the parents should really think it through and decide what they want. It’s wise to think even 2-4 years ahead too. Then they can figure out the steps that will take them there. Thanks Maureen. Good points. That is probably one reason why the first is so much harder thean the rest! This post is so right on! I’m a new mom of a 6 week old daughter. From the day we brought her home from the hospital we have been BW all the way. After the family stopped holding her 24/7 we had to CIO. It wasn’t easy, but so worth it – She slept from 10pm to 6am last night! There have been times we’ve had to “wing” because it takes time to figure your baby out, but a BW schedule helps you figure out your baby sooner. Not that she won’t surprise us with a challenge… Thanks for all your posts – they have helped with troubleshooting! Thanks fothupdate! I am glad things are going well for you! Previous Post Poll Results: What was/is baby’s approximate optimal waketime length for ages 5-6 Months? (waketime length includes feeding time)? Here’s our dilemma: We want to teach our 7-week-old good sleep habits, but we want to soothe her when she doesn’t feel well, too. She has gas and reflux, but not to the extent it requires drugs (though we have given her Mylicon). It seems like this wakes her up early from naps and keeps her up at night — or is it us? (We pick her up and walk her around until she falls back asleep). What do you recommend? Does Babywise really tell you it's okay to let a 5 day old cry themselves to sleep? If they're crying, they have a need. I don't understand… it hurts my heart to read this. 🙁 I agree with a lot of what you say regarding discipline and older baby stuff, but I just can't see why we should expect a newborn baby to sleep on their own when they are so used to the comfort, warmth, and safety of the womb. And to have a month old baby sleeping through the night like some women on here have mentioned… that's gotta be bad for your breastmilk to get regulated. Your body needs around 8 weeks to have the demand and supply of the baby on it to know how much breastmilk it needs to make. What does babywise say about this? Mrs. Sarah J,Here is what Babywise says about CIO:http://babywisemom.blogspot.com/2009/08/sleep-training-according-to-babywise.htmlI agree that babies can cry out of some need, but they can also cry just because they are crying.I also started sleep training with my third child but at 3 days old. With her, I added in the 4 S's. She didn't cry before a nap at all until she was 3 months old. That was for a couple of minutes at most for two different naps. Like I said in this post, I think it is unfair of me to teach a baby who already knows how to fall asleep without my help to need me to fall asleep, then "yank the rug" out from under her. So since my girls were literally born knowing how to fall asleep on their own (along with me watching and getting timing right), I went with it.A one month old shouldn't be STTN according to babywise. Babywise says at 7-8 weeks old, your baby might start STTN (which means sleeping 7-8 hours straight). Some babies don't until 12 weeks old according to the book–and in real life, many more don't until beyond that. Babywise has lots of rules to follow for establishing milk supply. I have nursed all three of mine for a year each. Well, my third is 11 months and one week old. So I guess I can't say that yet 🙂 But she is still nursing. I am having a difficult time getting my 7 week old who I cannot get to sleep in his own bed. When we brought him home we tried to keep him in the family room all day in order to correct his day/night confusion. Now I cannot get him to sleep in his own bed. When he cries he gets so upset he turns purple. Is it appropriate for a 7 week old to get so upset he turns purple. I keep trying over and over again to put him back down after he calms himself. He might sleep 5-15 minutes and then he wakes himself up and gets terribly upset again. I swaddle him, I have even put him to sleep first (I know I should let him soothe himself to sleep). He is exhausted, I am exhausted. I feel like I am torturing him. It sounds like he has gotten used to sleeping while being held and is having a hard time getting used to anything different.I would suggest you see the CIO Bootcamp Revised and Updated post. Before moving to CIO, you could slowly try to get him used to sleeping in his bed by helping him fall asleep, then putting him in his bed once he is asleep. Good luck! When doing CIO and schedule for a newborn do you have them their own room at night or in yours? This is my third baby with my first two I waited until 3 months to move them in their own rooms and CIO but with my son who is four weeks I want to start ealier.